Drafts for Mac is now available in the Mac App Store. 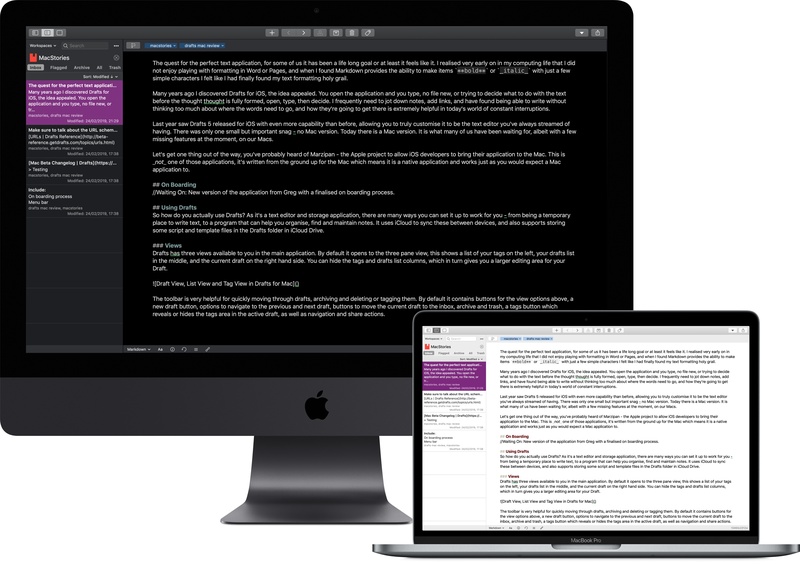 Like the iOS version, Drafts for Mac is a free download and can be used to create, edit and sync drafts. A Drafts Pro subscription is also available to unlock advanced features, like editor themes and workspaces. Drafts Pro subscriptions can be shared via iCloud, so if you already are subscribed to Pro on iOS, Pro features will be unlocked on the Mac version. Requirements: Mac running 10.13 (High Sierra) or greater. Sync requires iCloud (with iCloud Drive active). Where are actions in the Mac version? Action support is planned for the Mac version, but this initial release is limited to creation, editing, organizing and syncing drafts. We do not yet have a timeframe for the release of action support on Mac, but are working hard on it. I purchased Drafts Pro on iOS, do I need to purchase it again for Mac? No. Pro subscriptions can be shared using iCloud. As long as your are using the same iCloud account on both your Mac and iOS devices, a Pro subscription purchased on either platform can be shared. If you have an active subscription and are using the same iCloud account and your pro features are not automatically unlocked, please contact support. Thanks @RosemaryOrchard for the great review on MacStories! Downloaded Mac version and instantly bought pro subscription! So great to finally have Drafts on the Mac! Thanks! !